CHARDONNAY. Perhaps no other word so divides the world of wine. It is the world’s most popular grape variety and maybe it’s most disdained. Almost 18 percent of ALL the wine Spec’s sells is labeled “Chardonnay.” Add in Cabernet Sauvignon, Merlot, and Pinot Gris/Grigio and that number exceeds 50% of all wine Spec’s sells (figured by units sold). Even though Chardonnay soundly exceeds Cabernet Sauvignon’s slightly less than 14% of sales, that almost 18 percent Chardonnay number does not include all the Chardonnay from greater Burgundy that is sold with “place name” labels such as Pouilly-Fuisse, Macon-Villages, Chablis, Meursault, Rully, or Puligny-Montrachet. On the other hand, what other grape variety has inspired an “anti that variety” movement. Chardonnay has the ABC (Anything But Chardonnay) movement. I guess “Don’t Drink Gruner Veltliner” or “Anything But Trebbiano” just don’t have the same ring. While Merlot took a bit of a bashing in Sideways, there is no active anti-Merlot movement. Just about two years ago on the night before the Houston Livestock Show and Rodeo’s ™ International Wine Competition judging, I asked all the judges and officials attending a pre-competition dinner when the last time each of them had bought, paid for, taken home and drank a bottle of wine labeled Chardonnay (not Pouilly Fuisse or Puligny Montrachet). Not one of them could remember. All of these people are either members of the wine trade or press or the most avid of consumers – and none of them drinks Chardonnay on any kind of a regular basis. These folks are the supposed “tastemakers” and “trend setters” – and they don’t drink Chardonnay. In fact, many of my fellow self-identified “wine geeks” disdain it. So who is drinking all this Chardonnay? Well, a lot of people. Men and women in a complete spectrum of age ranges all drink Chardonnay. A certain group of women in the forty plus to almost sixty year old age range have self-identified as “Cougars” and have adopted a certain style of Chardonnay (aka “Cougar Juice”) as their drink of choice. La Crema Chardonnay (owned by Chardonnay behemoth Kendall Jackson) qualifies as Cougar Juice. Rombauer Chardonnay is the ultimate. So what is it about Chardonnay? Chardonnay as made generally in the new world and specifically in California varies widely in style. To understand the range of styles, it helps to understand a bit about the process. Chardonnay is a grape variety made famous by its use in Burgundy and in Champagne. It is now grown literally all over the world. It makes many of the worlds best white wines and some of its worst. Chardonnay lends itself to huge variety of styles. Winemakers like it because it is a blank canvas. Consumers often stick with it because it is comforting and familiar. The winemaker’s first decision is when to pick. Does the winemaker want the grapes to be ripe (but with fresh acidity), riper (more alcohol and richness but with some freshness) of ripest, or ripest (lots of flavor development but with softer acidity but with the rick of oxidation and a possible lack of freshness and charm. Of course, later harvesting leads to more ripeness and ultimately higher alcohol in the finished wine. Since Chardonnay is a white wine, the grapes are picked and then (generally) crushed and always pressed before fermentation. When the grapes come into the winery, they may be dosed with sulfur dioxide to kill any wild (or native) yeasts and bacteria or they may be left un-dosed to encourage a “natural” or “native yeast” fermentation. Most larger scale producers use SO2 so they can more closely control the process. Many artisan producers (including most of the better domaines in Burgundy) use natural fermentations. The producer may decide not to crush and de-stem and so do “whole cluster pressing” which can give a different character to the juice. Once the juice has been liberated from the grapes, the winemaker must ferment it. Here he has to choose which vessel to use and at what temperature to proceed. Will he ferment in barrels or tanks. If barrels, will he use all new, some used and some older, or all used (aka “seasoned”) barrels? And what size? 225 litters is standard but some prefer larger barrels such as demi-muids (600 liters) for reduced wood effect. If tank, does he use steel, wood, or concrete? With both tanks and barrels, the winemaker must decided whether and how to manage temperature. Cooler temperatures for fermentation retain more fruit and freshness. Warmer temperature develop more flavor and richness but at the cost of some of the fruit. Some winemakers go for complexity by fermenting different lots in different vessels (say 40% barrel and 60% tank) and at different temperatures. If all this works, it is “artful winemaking”; if it doesn’t work, it is “needless manipulation” or winemaking of for the sake of winemaking. Once the alcoholic fermentation (conversion of sugar converted into alcohol by yeasts) is complete. The winemaker must decide whether to allow malo-lactic (aka “ML”) fermentation (conversion of malic – apple – acid into lactic – milk – acid) to proceed, and if so, how far. Full malo-lactic will add richness and creaminess but a the cost of some fruit. No malo-lactic can yield a wine that is fresher and fruitier but not as rich and complex. Partial malo-lactic can split the difference. Chardonnays that have not undergone a full malo-lactic fermentation must be sterile filtered before bottling or risk completing malo in bottle, thus ruining the wine. Once ML has been completed or avoided (usually by adding SO2 to the barrels or tanks of wine to kill the ML bacteria), the wine mus then be further aged before bottling. While it seems logical that barrel fermented wines should be aged in Barrels and tank fermented wines should be aged in tanks this is not always the case. Each producer makes his own decisions and takes his own chances. I have had perfectly fine wines that were barrel-fermented and tank-aged and vice versa. Have you ever agonized over just when to take the cookies out of the oven? Some (many?) winemakers likewise agonize over when to take the wine out of barrels and tanks and but it into bottles. “Winemaker A” may to choose to pick at earlier (just ripe but with lots of freshness), go with a whole cluster pressing, and then allow for a native ferment in temperature-controlled Stainless Steel before sulfuring to prevent ML before racking half the wine off the lees and into French oak barrels (33% new, 67% seasoned) for six months. The other half is left on the lees in tank where the wine is kept cold to retain as much freshness as possible while still picking up a little lees-y richness. The wine is then reintegrated in a large blending tank where it is sulfured for a final time, cold stabilized, and then bottled after a sterile filtration. “Winemaker A” in following these steps will (best case scenario) make a fruit oriented, elegant, fresh, maybe even vivid wine. In the worst case, the wine could be lean and austere and maybe even green and under ripe. Winemaker B may choose to pick later (at the ripest but lowest acid level), dose with SO2 to be able to better select yeasts and therefore better control fermentation, crush, de-stem, and press before fermenting and 12 months of aging in all new French oak barrels (225 litter) with full ML in the barrel before extended lees contact and regular batonage before racking, blending and bottling un-fined and un-filtered with no cold stabilization. This set of decisions will (best case scenario) yield a wine that is big and rich with lots of oak and creamy-buttery character in the Rombauer Cougar Juice style. The worst case scenario is an expensive mess that tastes like everything but fruit. Many new world Chardonnay drinkers are so used to the taste of oak, lees, and ML, the can’t pick out the actual fruit flavor of Chardonnay. Which is too bad because, at least to me, the fruit flavors are the whole point of wine. From a fruit standpoint, it may seem that our two examples above are not even made form the same grape variety. Obviously, there is a lot of middle ground between these two styles, just as there are even more extreme possibilities in both directions. The harvested grapes are the raw materials; all the rest of it is winemaking. Knowing how much “winemaking” you like is just as important as knowing whether or how much you like Chardonnay. Nevertheless, there are some markers for Chardonnay. Chardonnay may offer tree fruit (apple and sometimes pear), citrus (lemon and lime, rarely grapefruit), and tropical fruit (pineapple in large yields, mango in full ripeness), and often some sort of banana (from green plantains to yellow bananas turned fully brown). This fruit may be marked with (or even obliterated by) all of the winemaking above. So lets say you have chosen a good bottle of Chardonnay from the middle ground. With what do you serve it. Many people drink Chardonnay as an aperitif in the same way they would formerly have drunk a cocktail. While I like Chardonnay, I’d rather have Champagne. Chardonnay can go will with chicken either roasted or fried (as long as the chicken is not too spicy). Chardonnay has a natural affinity for crab but crab is the only shell fish where I think Chardonnay first. Pairing Chardonnay with fish can be problematic because most chardonnays aged in oak barrels or in the presence of oak chips have at least some tannins (phenolic content) which can fight on the palate with the oils (fatty acids) found in fish. That’s why Chardonnay is sometimes called a “red wine masquerading as a white wine.” In any case, almost any good new world Chardonnay can be served with crab and especially crab-cakes (which, along with soft-shell, are my favorite). For richer fare try Chardonnay with pork or veal. 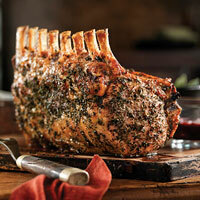 For pork options, try a bone-in loin roast from the shoulder end (this is the pork equivalent of prime rib) or thick tomahawk rib chops or t-bone loin chops, A pork crown roast is a fancier presentation of that rib roast mentioned earlier. Veal can be presented in the same ways and is equally at home with Chardonnay. Chardonnay also likes mushrooms so the choice of sauce or dressing can be made by the most unlikely ingredients. Just medium Pork (the new USDA recommendation is and internal temperature of 145°F which is down hugely from the recommended 170*F internal temperature. Oakier Chardonnays can work with steaks. Un-oaked (aka “un-wooded”) Chardonnays can go with lighter seafood dishes and can even work with oysters – as does real French Chablis which is, of course, Chardonnay. Although it often seems unlikely, some new world Chardonnay can age. Please note the qualifying words “some” and “can.” “Most” don’t. Age-worthy new world may be found by its acidity or freshness. Unless there is enough acidity to give Chardonnay (and almost any other wine) a firm backbone. Without that firm backbone, Chardonnay will not develop and/or improve. The highest levels of ripeness and malo-lactic fermentation work against the wines having enough acidity to age. And lees stirring and barrel fermentation can lead to enough oxygen exposure to make the wines early oxidizers which also works against age-worthiness. I mentioned above that oak aged Chardonnay has been called “a red wine masquerading as a white wine.” This can seem even more true when you realize that some of the best Chardonnays – especially when young – can benefit from decanting. This is not a decanting to get the wine off the sediments but to oxygenate this younger wines to help them open up for drinking. The proper technique is to splash the wine into a carafe or a large surface area decanter to allow it to breath a bit before serving. How long depends on the wine and how young it is. If you taste a young Chardonnay that seems “closed” or too tight, you have a candidate for decanting. Chardonnay can be served in a variety of glass sizes and shapes. Un-wooded types can be served in any good general white wine glass. 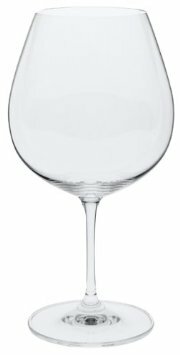 I have and Use the Riedel Vinum Glass they call “Grand Cru Riesling.” Wooded versions can need a bigger glass with a larger surface area. At home, I like to use the Riedel Vinum “Red Burgundy” glass for its large surface area, capacity (which helps with swirling), and acute chimney to help concentrate the aromas. Remember to never fill any wine glass more than 1/3 full and ¼ might be a better goal with most larger glasses. New World Chardonnay can run from $2.99 per bottle to as much as a couple of hundred dollars. The lower priced versions are the best sellers but there are some good sellers at higher prices. Spec’s (and everyone else’s) best selling Chardonnay is Kendal Jackson Vintner’s Reserve at about $10. By the way, if you like KJVR as it is widely known, you might try KJ Avant Chardonnay as a less-woody alternative. It makes an interesting comparison. Chardonnay under $10 accounts for almost 1.2 million bottle of Spec’s sales. Chardonnay priced at $10 to $15 accounts of another 500,000 plus bottles. Chardonnay $15 to $20 accounts for another 150,000 plus bottles. The $20 – $30 range adds another 76,000 bottles. The over $30 – $40 range adds another 43,000 bottles. Chardonnay over $40 adds another roughly 17,000 bottles. Notice a trend here? Each price point very roughly represents a halving of sales. I like Chardonnay. I don’t drink as much as I’d like because my lovely wife and most of my wine geek friends (yes, I too am a wine geek) don’t. However, for most simple pork veal, or crab dishes, there is little that works better. Great Chardonnay can be thrilling and complex and completely hold your attention. Yes, there is a lot of plonk out there with Chardonnay on the label. Don’t be fooled. Find and stick to the good stuff and you to will enjoy Chardonnay. Hyde Vineyard Chardonnays from Patz & Hall, Kistler, Ramey, Auteur, and Hyde de Villaine. This entry was posted in Chardonnay and tagged ABC, Bear Dalton, California Wine, Chardonnay, hanzell, Healdsburg Ranches, Houston, Hyde Vineyard, La Crema, Patz & Hall, Ramey, Ridge Montebello, Spec's, Talbott, Texas. Bookmark the permalink. Great info. Lucky me I found your website by accident (stumbleupon).